Positive carry and positive trend (Carry + / Trend +). Positive carry and negative trend (Carry + / Trend -). Negative carry and positive trend (Carry – / Trend +). Negative carry and negative trend (Carry – / Trend -). Positive carry and trend conditions imply relatively strong future returns (see the chart below). 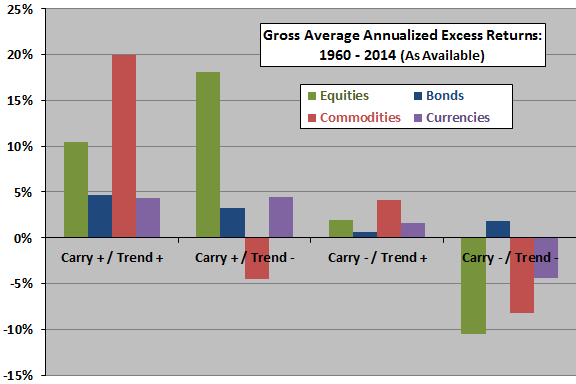 In particular, Carry + / Trend + consistently beats Carry – / Trend -. 30% of the time for equities. 52% of the time for bonds. 26% of the time for commodities. 28% of the time for currencies. Findings are robust across subperiods, including that of rising interest rates during 1960 through 1982. While carry predicts returns almost unconditionally, trend-following works much better when carry is in agreement. Carry + / Trend + is always better than Carry – / Trend -. Carry + / Trend + is not always better than Carry + / Trend -. Carry + / Trend – is always better than Carry – / Trend -. Carry – / Trend + is usually better than Carry – / Trend -. In summary, evidence indicates that carry and trend tailwinds are generally favorable for future returns across stocks, bonds, commodities and currencies. Reported returns are gross, not net. Accounting for the costs of changing positions with the carry-trend state would lower these returns. The paper does not test any strategy for timing or switching among assets based on carry-trend states. Some returns, in the absence of direct measurement prices, are simulated. Simulated data do not account for feedback to the market from trading or for market maker costs. As noted, Carry + / Trend + does not always outperform partly positive states, and partly positive states do not always outperform Carry – / Trend -. As noted in the paper, there may be more effective ways to measure carry and trend. Testing signals on many markets involves some snooping bias, such that the strongest indications tend to overstate expectations.